Esteemed as some of the most beautifully woven, intricately designed rugs from the Middle East, Kilim rugs exemplify a Caucasus-made, tapestry technique presenting patterns created by horizontal wefts covering vertical warps. 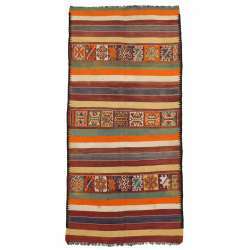 Since the Kilim technique of weaving makes it difficult to separate colors linearly and vertically, vintage Kilim rugs often have a crenelated or stepped appearance relying on vivid color effects, large patterns and impressively striking images. 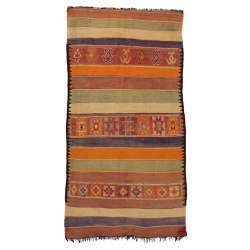 Most Kilims utilize medallion-like designs or one grand design encompassing most of the rug. 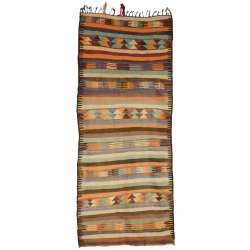 Anatolia or Turkish Kilims are highly sought after by rug enthusiasts, followed by Persian and Caucasian Kilims. The suppleness and durability of these magnificent rugs make them wonderfully versatile and appropriate for use as floor coverings, wall hangings and even bed coverlets. Many of the gorgeous rugs in our Kilim rug collection online have graced the homes of world leaders and art museum curators. 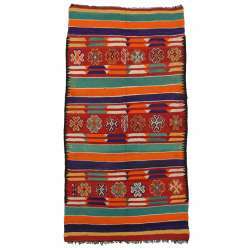 Skilled weavers using pure wool or a combination of pure wool and cotton or mohair have created our antique kilim rugs embellished with universally appealing colors, motifs and cultural designs. With a wonderful ability to bring comfort, harmony and deep aesthetic qualities to any environment, our antique kilim rugs have found homes in a variety of high-end commercial and residential buildings. Turkish kilims are adorned with a variety of fascinating motifs, such as the elibelinde, a widely implemented motif depicting a stylized female symbolizing fertility and motherhood. A wolf foot or wolf mouth motif reveals a weaver's desire to protect his family's herd of sheep, goats and cows from wolves and the deadly scorpion sting. Other motifs resembling amulets are meant to ward off bad luck from the “evil eye”. Birds, the yin yang symbol and Solomon's seal are other common good luck motifs adorning the tribal rugs in our vintage Kilims rugs collection. Mythologically inspired with peripherals of strikingly geometric images, our Persian Kilim rugs embody a past rich in turbulent histories, affluence and aesthetic substance. Woven with cotton, wool or hemp threads brilliantly colored with natural dyes, our Persian Kilim rugs delight the visual sense with whimsically spontaneous designs unmatched for their depth and intricacy. 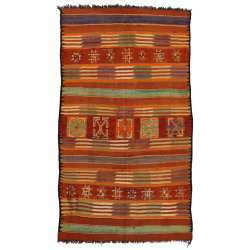 While browsing our Kilim rug collection online enables you to see how beautifully crafted and imaged Kilim rugs are, they must be intimately encountered to be fully appreciated. 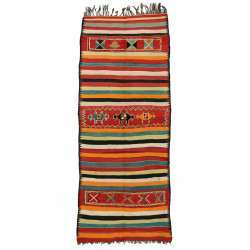 Find out more about our Kilim rugs for purchase online by calling Esmaili Rugs & Antiques at 214-651-7847. We have been serving thousands of satisfied clients in the Dallas Design District and Dallas-Fort Worth area for nearly two decades and look forward to making new friends who are enthusiastic about exotic rugs. Stop by our showroom any time between 9am and 5pm to talk to our knowledgeable staff or personally experience our magnificent collection of vintage rugs.